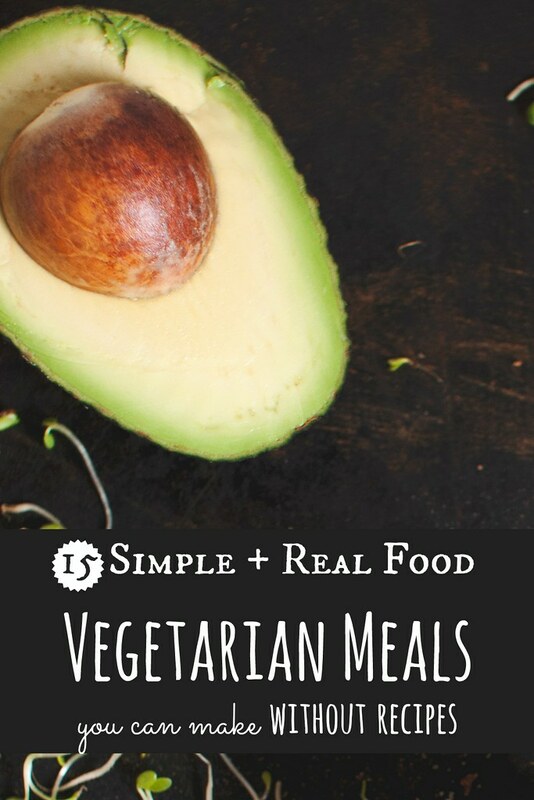 neverhomemaker: 15 Recipe-Lite Vegetarian Meals To the Rescue! There are weeks when all the meal planning in the world doesn't save my soul. When I look inside our kitchen cupboard and refrigerator drawers and get stumped. I need to make food -- and fast -- but I have little desire to cook, let alone follow directions. For these nights, which happen way more frequently than I let on, I have a secret catalog of easy to prepare meals that require very little energy and few ingredients. They are so simple, I have actually committed them to memory. And I figured it was time I shared them with you! Preheat your oven to 400 degrees F. Using store-bought pita or naan bread, spread some tomato sauce and top with shredded cheese. Top with whatever veggies you have on hand or leave plain. Bake until cheese is bubbly. This one is really loose and forgiving. I look in my fridge, find a vegetable or two and roast at 400 for around 30-40 minutes. Then I find a protein like tofu, beans, eggs, tempeh, etc. and fry that up with a little olive oil and season to taste. Then I choose some toast or other grain for the side. Dinner is done! Cook up your favorite brown or wild rice, fluff and set aside. Then saute your favorite greens (kale, spinach, collards, etc.) and heat some beans (black, pinto, kidney, chickpea, etc.). Add some scoops of salsa for extra flair or simply season with your favorite spice, salt, and pepper. Starting with garlic and onions first, heat some olive or sesame oil and cook until glassy. Then add veggies like broccoli, bell peppers, etc. and cook until softened, lightly browned. Finish with softer items like mushrooms and flavor everything with a dash of soy sauce and a sprinkle of sesame seeds. Crack open some eggs and fry or scramble with a liberal sprinkling of black pepper. Serve warm toast topped with Earth Balance or butter. Even chop up some potatoes and cook in a little olive oil until soft and well browned. Lots of hot sauce on the side. I think you guys remember this Avocado Egg Salad recipe from way back when. It's so easy, there's really no reason to follow instructions. To make it more automatic, hard-boil eggs at the start of each week, then grab them and mash with avocado, a little grainy mustard, some Vegenaise, salt, and pepper. Bake scrubbed potatoes or sweet potatoes in your oven at 400 degrees F for 40-50 minutes. Then slice carefully and stuff with your favorite ingredients, including beans, avocado, lettuce, cheese, sour cream, rice, salsa, etc. Saute some chopped garlic and onions in a saucepan over medium-low heat. Pour in a large (28-ounce) can of tomatoes, preferably crushed. Sprinkle in some salt, pepper, red pepper flakes, dried Italian spices, and Parmesan cheese. Finish off with a couple tablespoons of heavy cream or milk/alternative if you like. Simmer however long and serve warm. If you used chunky tomatoes and want a smoother soup, run through your blender or food processor. Get some good quality, crusty bread and your favorite melty cheese. Put in some onion, arugula, and tomato slices. Spread bread with some Earth Balance (or butter) and then cook on each side (medium-high heat) until golden brown and cheese bubbly. Preheat the oven to 400 degrees F. Drain and press tofu, slice into thick slabs, and dry again. Then massage olive oil and spices onto all surfaces (we like pepper, salt, thyme, and even this awesome smoked paprika-chipotle seasoning mix we have), and then place in a small oven-safe dish and bake for 45 minutes to 1 hour, flipping every 15 minutes or so. Eggs are so simple to prepare -- and they pack lots of protein. A crustless quiche is as easy as preheating your oven to 350 degrees F -- grease a 9 inch round baking dish. Then whisk together 6 eggs with salt, pepper, a handful of shredded cheese, and a chopped white onion. Then stir in several handfuls of chopped spinach or kale greens. Pour in your dish and bake for 30 minutes (until eggs have set) and let cool slightly before serving. Cook pasta (spaghetti works nicely with random meals) to the package directions. Then either steam or roast (400 degrees, coated in olive oil, salt, pepper, for 20-30 minutes until browned) veggies and combine. Top with some cheese or a drizzle of balsamic, even a little tomato sauce. I gave some more extensive directions to achieve kitchen independence with this classically simple dish. All it takes is dry or canned beans, chopped fresh or frozen veggies, some broth, and spices. Once you master the ratios and basics, you can make this dinner in a flash with even the strangest combinations of ingredients! Great for nights when you just have odds and ends in the refrigerator. Combine lettuce/greens in a large bowl with beans, seeds, chopped veggies, cheese, dried fruits, nuts, etc. Then top with a simple olive oil/vinaigrette dressing and toss around in the bowl to coat evenly. Veggie burgers need not be complicated. One of my favorite "recipes" takes minutes and requires just a couple ingredients. Use 1 medium sweet potato and about a cup of drained/rinsed black, white, or pinto beans. Combine with a mix of spices, salt, and pepper to taste -- then mash together with your hands or a fork and then heat on your stove top with some olive oil until golden brown. What favorites + meals do you make sans recipes? 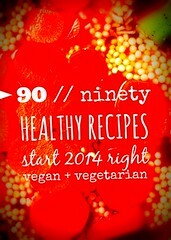 // Looking for more shortcuts to healthful, satisfying meals? Check out our tips for Automatic Healthy Eating!